Keeping the Pounds Off! : What is in a (an Irish) Name? What is in a (an Irish) Name? My sister-in-law is full Irish, her parents both born in Ireland, her name is Patricia (Tricia) and her birthday March 17th. She is Irish from her birthday to her toes. She is also a sweetheart and I miss not talking with her everyday the way we did when our kids were young and life was less hectic. Her kids are half Irish and Italian. Her husband (my husband's brother) likes beer and parades so we will allow that he is Irish by marriage the way Tricia and I are Italian by child birth. My husband is mostly Italian with a touch of German on his paternal grandmother's side (he doesn't like to talk about it, he likes to think of himself as fully Italian). I am Polish on my mothers side. From my father's side I am 1/4 German and 1/4 New York Foundling Hospital - which is where my father's mother hails. There is all this family fantasy crap about how my fathers mother was English and came over here as a baby and her brothers died working in the bowels of the Titanic. 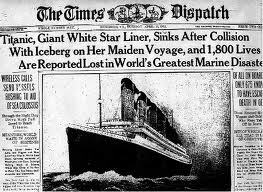 (That is a load of bunk as no one with my grandmother's last name was on the Titanic as an employee or as a passenger). When I was growing up, my mother always said my sister looked Irish because of her nose and freckles. 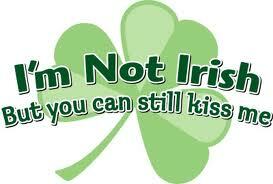 It didn't make us Irish. My youngest daughter is named Rory Caitlyn. Can you get much more Irish a name then that? Rory is a good name that can be used for a man (Check out Pierce Brosnan's character of Rory O'Manion in The Manion's of America - TV movie), or a woman (the name of the daughter born to Ethel Kennedy after RFK's assassination). Rorys name does not make her Irish but it has been a part of who she is her whole life. The Keeping the pounds off POINT here is this: there is nothing Irish about my family and saying anyone is Irish does not make it so. So, if I am a food addict and a compulsive overeater, changing that accurate label as applied to myself is not going to change the truth. I can say I have a hearty appetite or that I have a sweet tooth but that does not take away what I am. I am a food addict. I am a compulsive overeater. Like it or not, I am what I am and for today, I embrace the label as it is a part of me the way being Irish is a part of my sister-in-law. Nothing can change this about either of us. Tricia: May the wind always be at your back and the sun always rise to met you, or something like that.. . . . Let's just say Happy Birthday and I love you. * as long as the person immediately behind her has not enjoyed too much cabbage. 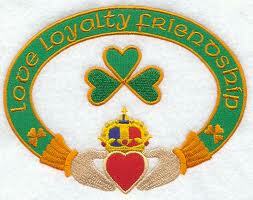 we are Irish Catholic, like escaped the potato famine Irish Catholic. My husband's family is very German with a little Irish too. My kids identify about 100% with the Irish side, and 100+% with the Catholic, they are even built like Irish including thick, brick feet. Oldest went to Ireland for a semester and I was a little worried he might not come back. Middle wanted him to find an Irish bride with a really great brother for her. Vickie - please send any additional un-attached irish men over this way - I have daughters.